For those people unwilling to read the entire post, here’s a direct link to my own list of operations and a description of how to perform them using specific input methods. Help people understand what has changed without going in too much detail. Provide insight in what options there are to fully leverage potential/productivity. Provide practical tips and tricks to help people enjoy using Windows 8. Windows 8 will run on regular processors (x86/x64) and on ARM processors (Windows RT). This means it will run on desktops, notebooks/laptops, tablets, smartphones. These have other screen sizes and are used in different ways (mouse, keyboard, touch) which requires a different user interface. There are now basically two user interfaces (UI) available. Whatever device (type) you use (touch based or not), you will start in the “Modern UI” which is called the “start screen”.You can switch from the “start screen” in the “Modern UI” to the regular Windows 8 desktop interface, but there is no start menu (orb button) anymore. The regular Windows 8 desktop interface people know from previous windows versions. 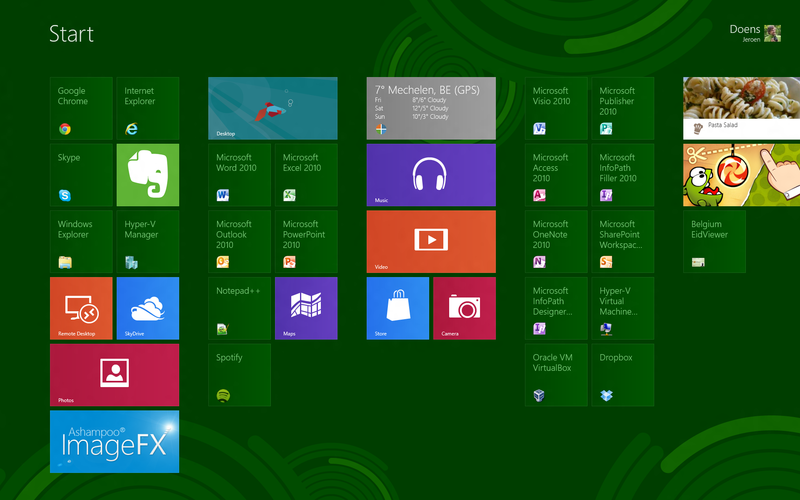 The “Modern UI” which in the past has also been referred to as the “Metro UI” or the “Windows 8 UI”. People who are familiar with Windows Phone 7 may recognize this interface that consists of squares and rectangles called Tiles. Tiles can show live status updates like by example mails, meetings, news feeds, high scores, etc. The “Modern UI” is designed to work better with touch interfaces and uses gestures (gestures alternative) both on touch screens and laptop touchpads/trackpads). They have been created to work with mobile devices for modern use (low power/resource usage, always online, notifications, touch gestures). When they are not active, they use less resources, so there is less need to really close them. Also they contain no x icon to close them. They can provide functionality to share information with other applications from within the application. By example when you come across something interesting from within an application, you could send information about it by mail, blog it directly to WordPress or save it to evernote or onenote. Windows 8 versions (Windows 8, Windows 8 Pro and Windows RT) have different features. The most important difference between versions, is that Windows RT will not be able to run x86/x64 applications you used on your previous Windows versions. Basically with Windows RT you’ll be using the “Modern UI”. Windows 8 includes a Windows Store from which you can download free and paid apps. This is similar to the way you can buy apps on android, apple and windows smartphones / tablets. For experts/power users, the following basic keyboard shortcut list will be sufficient (or this one , or this one). This article also provides a lot of useful information. Furthermore please use the tutorial in Windows 8, the help documentation in Windows 8 (Windows key + F1) and google. I’ve also created my own list of operations including descriptions how to perform them using specific input methods. It is of course also possible to combine these input methods.